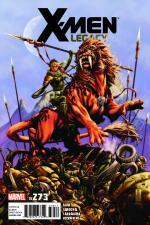 This is the third installation of my series of three comic book reviews, but why should I have all the fun? 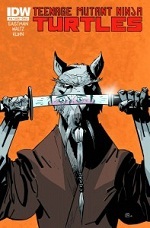 There has got to be other furries out there who read and collect comic books. I am going to open this up to them; if you read comic books and would like to review a few, just go ahead and submit "Pull List #4". Or whichever one's next. Just a couple rules; there must be three comic books, they should be of the regular, 32 page variety, not collections or things like that, and let's keep it to comic books that are, let's say, three months old at the oldest. So, any takers? Yes? No? Oh, well, on with the reviews! Last time, I talked about Christos Gage and how much I like him as a writer of comic books. This time, once again, I am spotlighting two issues by the guy, though from two different books. Avengers Academy features a variety of semi-furry characters, including Reptil, who can transform into various dinosaurs, and White Tiger, who has tiger based skills. 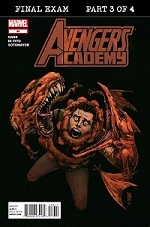 Avengers Academy #36 is especially furry, as it features both these characters in a position where they have lost their powers, both from magical amulets. They must recover these magical amulets, and are forced to come face to face with the powers behind them, which results in some very furry scenes. White Tiger negotiating with the magical tiger is a great scene especially, both as furry and just superheroics. The rest of the cast, though not nearly as furry, are also facing similar challenges, as the issue's villain has shut them all down — and has the means to stop all superheroes, claiming that they are extremely dangerous. I like how the issue acknowledges that this is not the real world; in our world, superpowered individuals might be a threat, but as a character points out, this is a world where alien invasions happen every Tuesday. They really do need superheroes. The art by Andrea Di Vito is very "comic booky", and fits this story, which is very "comic booky," as well. However, as a furry, I can actually say I have seen better astral tigers drawn elsewhere. I did not really pick two comic books that deal with what superheroes are, and what they can and cannot do, on purpose, but Teenage Mutant Ninja Turtles #14 deals with similar issues to Avengers Academy #36. Both are titles about relatively young superheroes, and both deal with the ethics of superheroes. In this issue, the main story follows Splinter teaching Raphael the difference between justice and vengeance; Raphael has gone to exact revenge on Casey Jones' father for his abusive tendencies, and Splinter agrees that the abuse cannot continue. However, he teaches Raphael that there are some choices that should not be made angry. His solution to the problem has sets up some interesting additions to the traditional Ninja Turtle cast and how they interact. Meanwhile, both General Krang and the Shredder are busy plotting future arcs for the turtles. One thing I am not a fan of in this series is the art. It just become less and less detailed as time goes by. It seems to be a conscious decision to bring the turtles back to their down-and-dirty independent "comix" roots, but it just bugs me. Gage finishes up the three part arc that I covered last time. It is a common story of an Earthling on an alien planet, fixing problems that he or she should not be able to fix on said planet, and basically becoming the ruler of said planet. In this case, Rogue plays the part of the Earthling hero, bringing peace to a world full of warring aliens; furry catpeople on one side, and ugly insects on the other. She reveals a conspiracy between the ruling heads of both groups to keep them at war forever, but finds a way to show them that they work better together than seperate. I do like that it is the ugly insects who actually come out looking better in the final story; they are the first to admit some of the things they did weren't exactly nice, and they are much more merciful with their traitorous leader than the pretty kitties. Then, in the end, Rogue returns to Earth, just in time for the finale of Avengers vs. X-Men! The art by Rafa Sandoval is alright; I really have nothing to say about it. However, Mark Brooks cover is completely awesome. It has nothing to do with anything that actually happens in the issue, but it is awesome anyway.